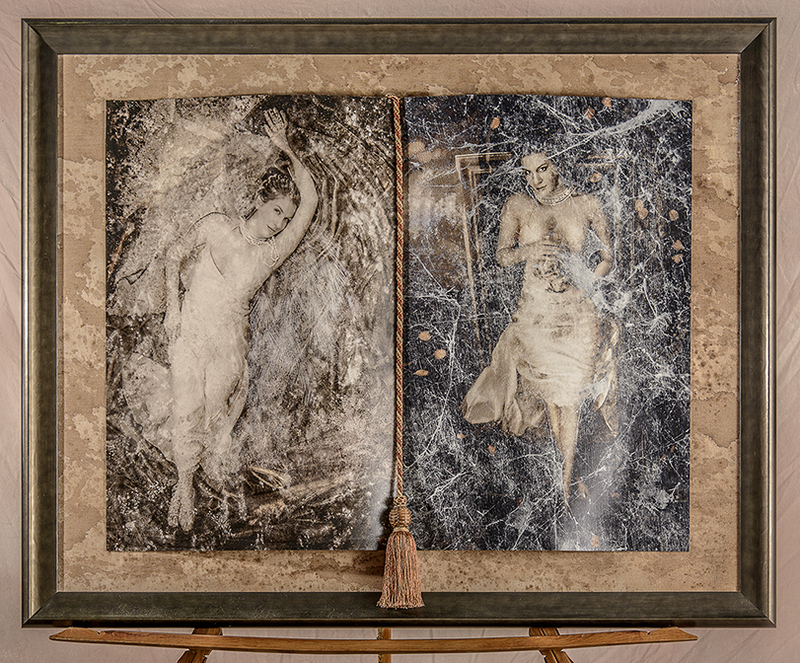 A 44 x 32 three-dimensional diptych, displayed in the style of an open book. Cristin from Everett, Wa commissioned Rob at Chapter Photography to “create something cool”. The first step in creating a fine art portrait is to set up a planning meeting. I learned many things that would help in the creation of her portrait. Cristin graduated from Cornish College of the Arts. Soon after graduation she married Brad. Cristin wanted to give Brad a 1st-year-anniversary gift, “something special”. Well knowing of her fine art background, I suggested a Lady of the Lake session (click here to see a gallery of images). The only requirement is she didn’t want to damage the dress. Perfect, this session is unique because I build a pool in the studio and fill it with 8 inches of warm fresh water so the dress shouldn’t get damaged. Now the fun begins. I have found the combination of water and fabrics create a unique and spiritual feeling in the people that choose this session. “I wanted to create a portrait of Cristin that explores the two sides of women. One side is the little angel our parents love, the other side is the tempress a husband discovers”. Durning our preplanning meeting, I also found out Cristin’s favorite type of artwork in school was print making. So I decided to do a print transfer. This method reminds me of the silver halide fine art prints I made in the darkroom at school forever ago. 🙂 The final artwork is a 3-dimensional diptych, displayed in the style of an open book, with a tasseled bookmark separating the two images. If are you ready to step outside of your traditional photographic box; call Rob at Chapters Photography to start your Lady of the Lake experience.